SAY HELLO TO GRETCHEN! Gretchen is a an adorable 2 year old red Chihuahua girl. Weighing in at just 10 pounds, this brave little lady was surrendered to our rescue with her 4 little puppies in critical shape. Severely neglected, they were all emaciated, full of worms, frightened and in very poor condition. Gretchen and her puppies struggled to recover. Her puppies being weaned and adopted, Gretchen is ready for her very own forever home! Gretchen is an unusually level headed Chihuahua and not the shaking, timid type you may often see. She is not a yappy dog and her temperament is exceptional! Gretchen rides well in the car, walks on a leash and sits on command. She gets along with other dogs but would love to be your one and only princess! She gets on well with adults and kids that she has met at her foster's home. She has no issue with strangers, however needs a slow introduction until she gets to know them. 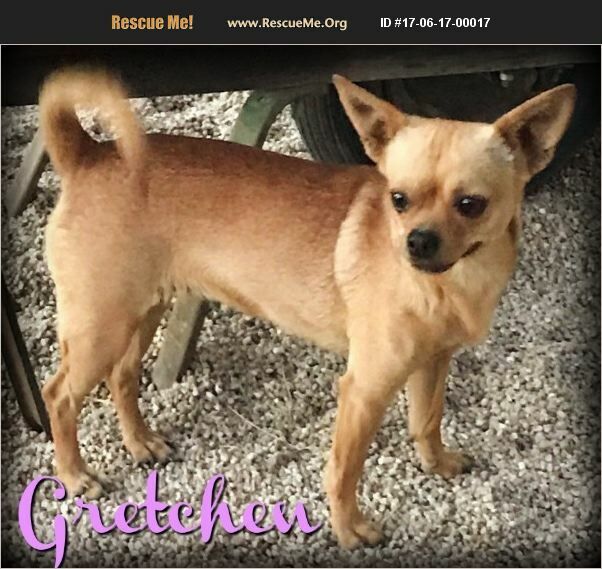 Gretchen will do great in an adult family or adults with older kids and teens who understand and respect her small size ... no infants, toddlers or little kids. Gretchen is a short coated breed who has a low maintenance grooming schedule. Baths as needed and of course, nail trims and ear cleanings. Gretchen's adoption fee is $85.00. This fee includes her spay, all Veterinarian Wellness visits, all vaccinations including rabies and bordatella, de-worming, microchip and professional grooming.